We all know how important it is to be sun safe in Australia and with Vivid Promotions' fantastic range of SPF30+ Sunscreen Products, it's easy! Choose from our wide range of Printed Promotional Sunscreen's and Sunscreen Lotions for your next event. Perfect for Summer Events, Outdoor Activities, School's, Beach goers and more, our low cost Sunscreen Products are sure to impress. 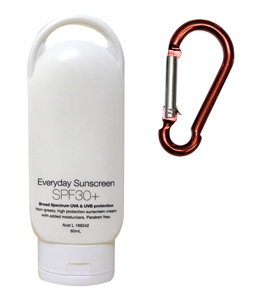 Everyday 30+ Sunscreen: Check out Vivid Promotions' handy 35ml Sunscreen Bottle with Carabiner. This compact SPF30+ Sunscreen moisturiser is made with a non greasy formula for easy application and is presented with a 1 colour print. 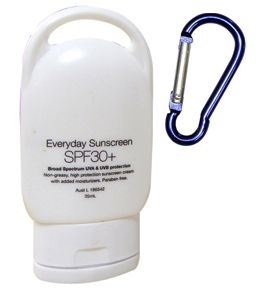 The carabiner allows you to hook the Sunscreen onto your bag, keyring or shorts for easy access when in the sun! 65ml Sunscreen Bottle: Protect your skin from burning in the harsh Australian sun and apply SPF30+ Sunscreen! Vivid Promotions' fantastic 65ml Sunscreen Lotion with Carabiner can be customised with your corporate logo or sunsafe message. Great for all outdoor promotions, this low cost broad spectrum Sunscreen is a great addition to your beach bag! Vivid Promotions' Printed Promotional Sunscreen Lotions are a great way to promote your corporate logo or sun safe message to all ages. Presented in a wide range of styles, our Branded Sunscreen Products are sure to suit all outdoor, summer and health related campaigns all year round. Living in Australia, we know all too well that the sun can burn in an instant and this is why it's important we spread a sun safety message. Take a look at Vivid Promotions' Sunscreen with Carabiners, Full Colour Sunscreen Sachets, Printed Sunscreen Spray Bottles, Branded SPF30+ Sunscreen Tubes, Hands Free Sunscreen and also ourAfter Sun Care Products. 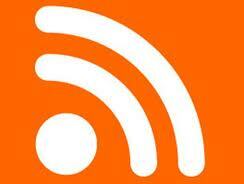 Enjoy the outdoors and promote your message for all to see! Contact our sales team on 1300 72 70 92 for the best price on Promotional Sunscreen. IMPORTANT NOTE: Discounted pricing does not include 10% GST, set up charges or delivery charges.